However, taking a certain amount of risk has always been directly proportional to an amount of return from that trading activity. Who is a trader? What does a trader do? A trader is someone who takes a risk to win, and that winning is making money. He analyses financial and economic data, uses technical skills and identifies profitable trading opportunities in the stock market. However, taking a certain amount of risk has always been directly proportional to an amount of return from that trading activity. There are definite ground rules for a trader, irrespective of the financial instrument he trades in. Higher the risk one takes, higher will be the returns earned. 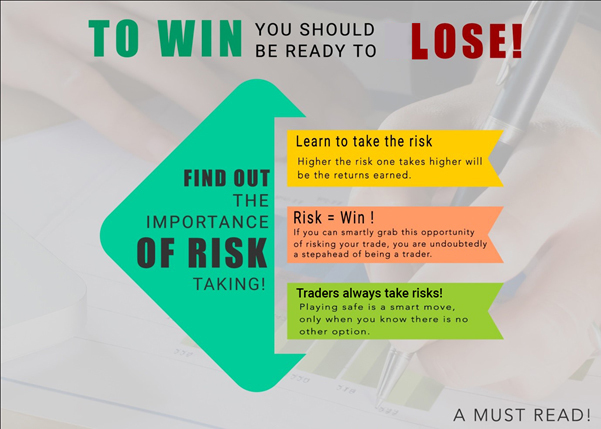 If someone wants higher returns, he or she has to learn to take the risk as well, which means increasing the chances of losing the money. Further, it is essential to take smart risks. Risking a trade where there is a sure shot probability of losing the money, may not be a smart move. Playing safe is a smart move, only when you know there is no other option. However, if trading opportunities with higher returns are available by taking a risk, you should go ahead. Taking a risk in trading alone is not enough. If you want to be an ace trader, you should learn to take smart and calculated risks after realistically evaluating your risk appetite. More importantly, you should objectively assess the extent of risk you can undertake. For instance, a discussion at University of Michigan concluded that ‘optimistic accounting leads to 99% of problems’. Being optimistic about a win-win situation while trading in the market may not present a very realistic picture. Trading is desirable when it is done with a more objective approach. If you are going to get depressed when a trade doesn’t go your way, trading is not for you. To be a successful trader, it is crucial to think practically and accept losses positively. You can compensate for your losses, if you play smart. Trading gets attractive once you start getting returns. However, these gains might not be constant and you may learn this the hard way. So, never get too confident about trading. If you stay strong with the basic trading principles and thumb rules, you will do wonders as a trader!